There's been an image going around on social networking sites that displays a certain caption. A caption that's got child abuse survivors up in arms. But it's been my experience, and I know I'm going to get backlash for this, that when people are angry there is often some truth involved. What was the offending statement? Quit blaming your parents for everything wrong in your life. This line seems relatively tame. 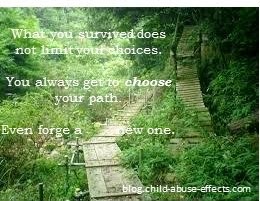 But when you come from child abuse, it can have lifelong adverse effects. It's fairly common for abuse survivors to carry anger and hostility throughout adulthood and blame their parents for their dysfunction. And there's ample scientific and psychiatric evidence to back that up. When someone says Quit blaming your parents, survivors typically hear, What happened to you did not matter. As much as the first statement upset survivors, it was the coupled statement that really riled them. Be grateful they saw you through your teenage years and didn't kill you. Oh boy. That last one is a tough one for someone who went through brutal abuse at the hands of their parents. Especially when someone has a parent that actually did come close to killing them. I'm not at all oblivious to this. My own mother came yay close more than once with her vicious abuse. Even so, I'm going to go out on a limb here and defend the statement. Even though some of my social networking friends went the opposite path and chose to write a post, essentially giving permission to survivors to keep blaming their parents for their lot in life. Even giving permission to never forgive because after all, what happened to them was unforgivable. For those of you who aren't too angry to keep reading, here goes. What I'm saying here is two-fold. One, there is humour involved. Humour almost always offends someone. The last statement was meant to be humourous. And though it isn't funny to those of us who went through abuse, it was never intended to make light of the abuse that someone might have suffered. And yes, I do understand that there are some things one never makes light of. Like the holocaust, for example. But the author of the quote didn't say anything about or make light of child abuse. It was meant to address the sometimes highly irritating behaviour of adolescents. Two, and this is where there might be anger directed at me...the first statement needs to be taken seriously. As long as we continue to blame our parents for the choices we make now, as adults, we never have to take responsibility for our choices. Yet we want our parents to take responsibility for what they did to us, never taking into account that they may well be using the same excuse. As long as we continue to blame our parents for the choices we make now, we give up our power. We basically throw our hands in the air and say, I give up. You control me. I will forever be tied to you. You own me. As long as we continue to blame our parents for the choices we make now, we limit our potential. In fact, we completely constrict our potential. Potential that is limitless. We can choose for hardship to define us or we can define the hardship. We can find a way to bring purpose to what we endured. We can walk a path of choice or forge a new, uncharted one. The choice is ours. Always. No matter what we lived through as children. Blame gets you nowhere. It keeps you stuck. And it keeps you tied to the very people you don't want to be tied to. So for the sake of your own health and well-being, stop playing the blame game,. You are not limited by what you endured. Be empowered by it.